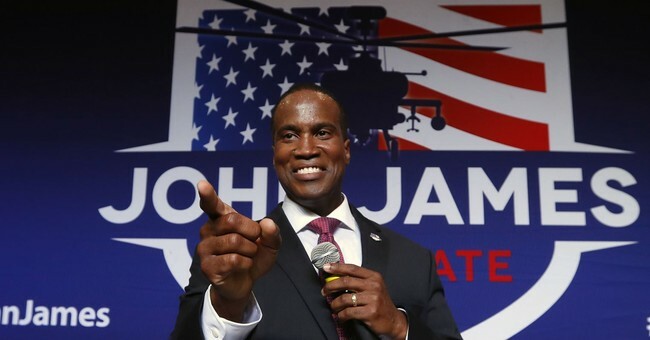 John James is a Detroit businessman, a West Point graduate and an Iraq War veteran who's running for the U.S. Senate in Michigan. He describes himself as a "pro-business, pro-life, pro-Second Amendment conservative." President Trump has given James his endorsement and is sending his son Donald Trump, Jr. to go campaign with the candidate next week. Grateful for the support, James was eager to return the favor. “I am proud to receive the endorsement of President Trump," James said. "With this morning’s announcement of 4.1% economic growth, America’s economy is thriving under President Trump’s leadership. I want to help the President create more economic opportunity, secure our borders, and strengthen our national security. From the battlefield to the boardroom, I have the experience to get the job done for Michigan. I look forward to working with President Trump to help create policies that better the lives of Michigan families." Critics have used the announcement to trash James's reputation. Nothing describes @MIGOP better than a man who has done nothing of value but mooch off his daddy--who mooched off *his* daddy. No action, just words. The vet knew exactly how to defend himself. That mic drop message has earned nearly 21,000 RTs so far. Trump Jr., Kid Rock and company will stump for James in Pontiac on Wednesday, Oct. 17. As of now, incumbent Sen. Debbie Stabenow is ahead by double digits.